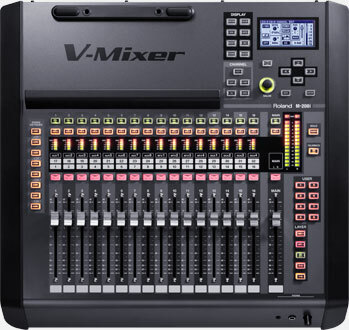 The M-200i is a part of the V-Mixer lineup which includes the M-480, and the M-300. To find out more about how each model compares see the V-Mixer Comparison Chart. With the built-in REAC port, it is easily expanded to include remote I/O simply by adding a Roland Digital Snake head. Expand further with any other device from the REAC family including Personal Mixers and/or Multi-channel Recorder/Player technology. Inside it is equipped with a fully spec'd 32 channels plus Main LR, 8 AUX, 4 Matrix outputs, along with 8 DCA groups. It is loaded with four multi-effect processors and four 31-band graphic EQ units which are requirements for any professional live sound production. Other popular functions including WAV recording/playback using USB memory, remote control via PC/Mac, and DAW recording. Add the powerful and comprehensive iPad app to control the M-300 V-Mixer. Available on the iTunes AppStore. The flexibility and mobility of comprehensive iPad control fused with the reliability and precision of a professional digital mixing console.